The words in the Analytic Language of John Wilkins are not awkwardly created arbitrary symbols; every one of its letters is significant, just as the cabalists treat the letters in Holy Scripture. Mauthner observes that children could learn this language without knowing it is artificial; later, in school, they would discover that it is also a universal key and a secret encyclopaedia. …there exists a single, necessary arrangement running through the whole of the classical episteme: the association of a universal calculus and a search for the elementary within a system that is artificial and is, for that very reason, able to make nature visible from its primary elements right to the simultaneity of all their possible combinations. michel foucault, the order of things (london: routledge 2002), 69. orig. les mots et les choses (paris: gallimard 1966). 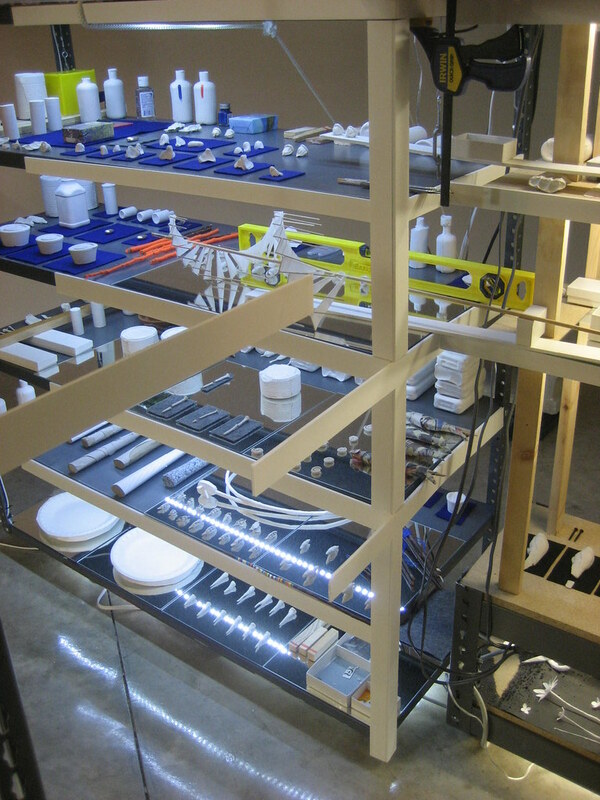 when confronted with sarah sze’s the uncountables (encyclopedia), we face a similar obsession with unknown systems of classification, but with no desire for an elementary system. sze directs our attention to the incomplete nature of her task: the uncountables does not attempt to be all-encompassing, it understands its own fragmentary nature. this is a private language, using objects that we know but that are removed into sze’s particular classification system. sze’s systems of classification are applied equally to the detritus materials of daily life and to preciously fabricated typologies. although her work famously uses an amalgam of everyday objects, in the uncountables we see a proliferation of manufactured items, similes of common types covered by a coat of white (from bottles to what appear to be clay models of rodent fetuses) or wrapped in graphic print (from milk cartons to fishes). the whole display becomes architectural in that it has thresholds, passages and entries, but the tilt of the structure destabilizes our momentary impression of shelves and display cases and highlights the precarious equilibrium of the system. further emphasis on fabricating the incline is made through the use of levels, as well as the tectonic expressiveness of the structure. 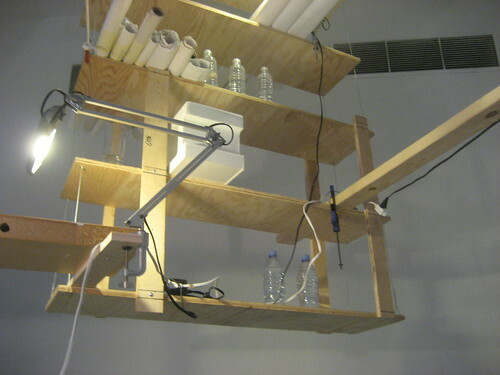 the assembly of clamps, boards, and simile-cmu bricks would seem to indicate a degree of improvisation which contrasts with the careful equilibrium of the whole. the architecture of this system required careful planning, and sze might be alluding to it in the assembly of rolled-up plans that are carefully tucked away in the far-off corner, carefully cantilevered just over our heads, out of reach. sze’s uncountables reminds us that our lives are littered with objects, an avalanche of never-ending debris. we deal with this infinite surplus by selecting, redefining, and wrapping objects into new, personalized containers. we create mirror images, and fabricate our own private, unstable languages, but cannot possibly account for the whole. these mental constructions are always in precarious equilibrium. but although each person’s system might be as unsettling and foreign as a language we have not mastered, it is still the only link that we have to communicate with each other and deal with the endless surplus of life. disclaimer: not meant an art review, but rather an attempt to use sze’s work to think about our own order of things. i have deliberately limited this commentary to only one of the works on display. 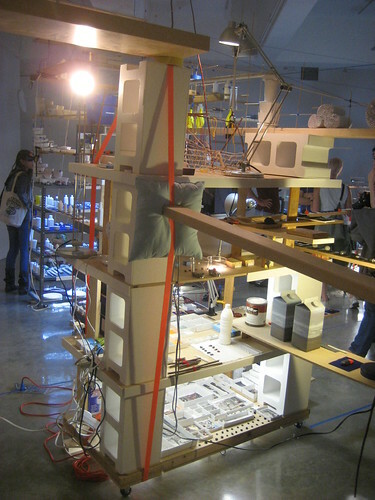 see sarah sze on display at tanya bonakdar gallery september 16 through october 23, 2010 (press release).